Venice Area Mobile Meals, Inc. is located on the premises of Village on the Isle. Take Business 41 north over the South (Circus) bridge, and make a left turn at the first traffic light at Avenida Del Circo. (If you reach the Venice Hospital, you have gone too far.) Make your first right turn into Village on the Isle. Proceed to the first stop sign and turn right. Follow along the driveway, past the Marketing entrance on your right, follow the driveway to the left and the main entrance will be on your right. Alternatively, the first side street north of Avenida Del Circo is Plaza Mayor, with Emmanuel Lutheran Church on the corner. Turn here and take the first left after the church parking lot. Proceed to the first stop sign. If visiting the office, look for VISITOR parking in this area. Guests and new volunteer applicants proceed to double glass door entrance on the north side of the road way near the second stop sign. Take Business 41 South. Proceed past the Venice Hospital. Just past the brick wall along the roadway painted with Circus images, turn right on Plaza Mayor, just before the Emmuanuel Lutheran Church. 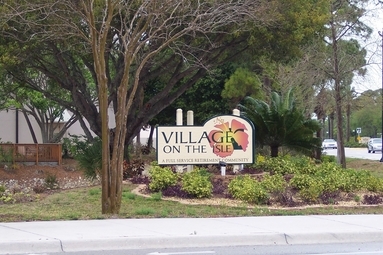 Take the next left, entering onto the campus of Village on the Isle. Proceed to the first stop sign.